This post is not about me, but I cannot help but share a vital fact: I tried to write many times, many years ago, and could not. I chalked it up to youth and a lack of complaint-worthy and celebratory experiences to deconstruct. There was no use to it. Whatever it was that drove the youthful writer, I did not have it. Which is why it’s a joy to meet someone in the ‘before thirty category’ laying down thoughts, scenes and stories with an ease I didn’t find until much, much later. It took more than a few weeks to put together that “Carlos” was actually “Kobe” and that he belonged to Brianna, who lived six doors up from us. Since the day she and I met, we committed to co-parenting this very special cat, while fostering a mutual appreciation of all things writerly. Not only did our cat tease a new novel out of me (#3), but he ignited — I believe — a spark in my writer friend that only a true muse can facilitate. But I’ll let the writer speak for herself. 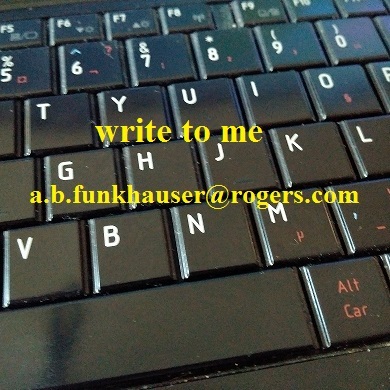 She is a member of the Writer’s Community of Durham Region and speaks volumes through her keyboard. Though her tastes seem to lean toward shock horror, I believe she is capable of just about anything. Meet a new writer with a fresh perspective. Hello, Bri! Am I? Thank you for the reminder ha ha. I suppose I am a writer, or playing at being one at least. It’s the only passion I’ve ever pursued, and writing really is a labour of love for me, emphasis on the labour. It’s exhausting! It’s like going to the gym: pushing yourself to go is the hardest part, but the payoff from the workout is always worth it. And with writing, I can drink a beer and don’t have to wear pants while I work, which I can’t do at the gym. Trust me. I love that story you wrote about the dating game. What draws you to shock horror? I actually wrote that one with shock value in mind because I thought it would help me win a contest. (It didn’t). I prefer subtle horror, stuff that’s quiet and lingers. I like horror that lives with you in the back of your mind long after the initial scare. Any sleepless nights because of it? Unfortunately, no. Nothing I’ve come up with scares me enough, which is too bad because I love nightmares. The only thing that keeps me awake at night is my anxiety, which is something I want to explore more in my writing. I’ve got a couple fetus stories (not stories about a fetus, but stories in the early development stages, just to clarify) about my fears blown up, but nothing concrete. Tell the readers how we met. Through a mutual cat. When Kobe moved in with my parents he expanded his territory and had little care for peoples’ personal property. I remember you saying how one day he came to your door and marched himself up to your bedroom where he slept for hours like he owned the place. Over the years, Kobe’s constant back and forth between our houses brought us together; we’ve been co-parenting ever since. The arrangement with Kobe is, in my view, very modern and insightful. Do you think he knew all along that we’d make him a star? Absolutely. I think he sought us out. Cats have much better sight than us humans and I think that goes for their foresight too. I bet he pissed off the neighbours on purpose so that letter from the city would reach you and inspire Shell Game. Which brings me to that fab FOREWARD you wrote for the book. It’s beautiful. Have you ever tried literary fiction? No, but I want to go there. I recently finished Karen Russell’s collection Vampires in the Lemon Grove and realized that’s the kind of writing I want to be making. Where the stories are strange, but each word is deliberately chosen and every other sentence makes you stop and say “Wow!” I don’t want to lose the horror element, because it’s what interests me, and I think there’s quite a bit of movement within the genre. But careful crafting is just as important. I want to coexist in both worlds. Ed. — Then you just have to meet horror poet A. F. Stewart. She boggles! Please! I’ll take all the free exposure I can get! I’ve always been a “cat person.” Their aloof, self-sufficient nature matches my own, and I enjoy a good meow. As a child, I would spend hours spooning the family cat in some quiet corner of the house, whispering secrets and insecurities into his twitching ear, as if he were a best friend or a diary. Skin to fur, heart to heart. We had other pets, but it was the cat I sought out for this ritual: something in his jewel eyes told me he was really listening. My mother once told me that on Christmas Eve the cats could speak. Though I never witnessed these conversations, I did not doubt their reality; the cats were capable of magic because they were cats. It seemed silly not to believe. My belief was strengthened when I met Kobe. Even as I wrote these words he appeared at the kitchen door, as if summoned by my thoughts of him. We started as roommates in a windowless basement apartment, where Kobe focused his energy on squeezing into holes in the drywall or escaping out the side door between the legs of the pizza man. Without a word, he was sending me a message: Let me go. We moved Kobe into the suburbs, to my family home. There, his territory grew like the muscles beneath his fur, and he transformed from house cat to panther, watching over the sleeping streets and feasting on the season’s rabbits. The neighbours quickly got to know him, and he needed no collar to bare his identity (mostly because there wasn’t a collar he couldn’t slip). A graceful, savvy creature with a mind as sharp as his claws and a love for human attention made him the talk of the neighbourhood. Our own local celebrity, if you will. Kobe met A.B. before I did, though her home is closer than our mailbox. A writer who, at the time, did not consider herself a cat lover, she fell hard for the feline (tall, dark, and handsome works for cats too). Kobe changed both of our lives, inspiring Funkhauser’s writing, and gifting me a mentor and dear friend. Kobe haunts our neighbourhood like a friendly ghost, lingering long enough to be missed. He shows up when he is least expected, but most needed, providing comfort in the touch of his fur and a silence that says: Lay it all on me. At times Kobe is stingy with his affection, but he is just guarding his truth, keeping we humans guessing. We must remember that a cat’s trust has to be earned, like a blue ribbon to be pinned on the wall. Shell Game was born because of a cat. The muscular, onyx beast who is undeniably something more. He will keep you waiting longer than the guy who hasn’t called, but love you for all of his nine lives. Kobe, or “Carlos the Wonder Cat ,” as you’ll come to know him, is as unique and complex as any human character you’ll read. He is the magic. He is our friend. I have a few projects on the go, which is my downfall. I jump off so many different ideas and rarely have the focus to finish anything. One story I’m playing with revolves around two sisters, autism, guilt, and a closet monster. I’m also working out the logistics for a small webcomic about a slime princess and her wannabe Prince Charming, all done in MS Paint. I’m eager to see if either project reaches an ending. Hmmm let’s see. I’ve got an online portfolio in the works, but until it’s up, I’m most active on Instagram @brivolinz. It’s the only social media platform I can competently use. Also I have to thank you A.B. (and Kobe) for letting me tag along on this fantastic adventure. I couldn’t ask for better mentors or friends. My pleasure, Bri. One thing I’ve learned from the writing journey is that writerly folk are generous. We talk, promote and share our stuff. Good things come from this. Bri brought along a sample from one of her WIPs. As usual, it is mysterious, clothed with that creepy foreboding she’s so good at. When the third child within ten miles of town disappeared, your mother insisted the summer be spent indoors. Not behind her doors, maybe, but someone’s. “You mean Mrs. Gnatwater,” you mumble heading down the walk; everybody knows her place is crawling. You rake your hand across the chipped tawny siding of Number 18, and when you depress the doorbell your finger is CheeZee orange and leaves a neon fingerprint. At your feet, a slop of coffee grounds shimmers, only to be scalped by the metal door frame as it swings open. A slime trail the colour of blackberries smiles up at you from the bungalow’s porch. “Watch the ants,” says Mrs. Atwater’s voice. Inside the place is swollen with piles, like a mouth full of sores. Mounds of clothing stalagmite the floorboards. An overgrown mass of dish towels has split open, and from its core slinks a mildewey stench. Smudgy limbs of naked baby dolls climb up from behind a couch, just segments of body parts visible, like those pictures of aborted foetuses they make everyone look at in Science B. “Where do I start?” Dust tints your face grey. A gob of chewed gum grows like fungus from the under lip of the kitchen counter, some of the fleshy wads still slick with spit. Mrs. Atwater cricks her shoulders into a shrug and disappears behind a mountain range of bedding. Alone, you let the sacred Eenie Meenie Miney Mo guide you to a cluster of shoes near the pantry, where you spend the next hour picking through crusted laces and light-up heels. You pretend not to recognize the names from the milk cartons scrawled in faded marker on three of the soles. Thanks for stopping by, Bri, and good luck in all your writing endeavors. Keep us up-to-date! Help a young writer grow her following. Find Bri Volinz here!